Well we've been using Rain AI for about a month now. It's a very handy AI system, takes a bit of learning to get it down but once you get it it's easy to freestyle on it to get solid results. First off, check out Rain AI if you're looking for a Unity3D AI System (it's free for Indie too!). My experience after a month of using it has been mostly positive, with the odd Unity crash, I think I've worked out the major issues that I ran into just mostly teaching myself, trial and error. The good is that it was relatively easy to set up. There's quite a few tutorial videos out there to help you through setting up a basic AI System (which a lot of the logic I actually still have for enemies, just heavily modified). This is the series of videos that I used to get started via CodersExpo on YouTube. Also, it's hard to argue with an engine like this that allows indie developers to use it for free. The bad, well I'm not sure how bad it is per say, but it does require doubling up on prefabs etc. If you have 1 or waypoint routes or waypoint networks, you have to create a new AI script. Check images just for a in your face example. 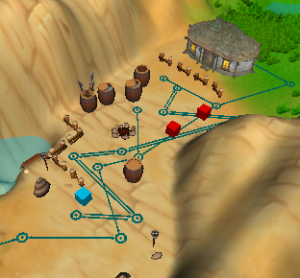 You'll notice that these are different camps with different waypoints, but we plan to have some of the same enemies. This means we need 2 prefabs for the same enemy, just so that each can hold their respective AI scripts so they go on the right path. If you try naming paths the same, it will just pick the last path with that name to load and have the enemies move towards that. At least that's my experience and I haven't found a way to get around doing this. It's bad asset management, but in a way it is nice to have individualized sets of enemies that you can modify completely separate from other parts of the world. Just added in Archer AI today, which was very simple in that it uses the villager AI system, but has a larger "far detect radius" meaning that it will see and chase the player from further away. As well as a larger "near detect radius" which essentially allows the archer to be an archer and shoot from far away. If the player gets close enough an archer will continue to fire, because they're not that smart at the moment. They will eventually flee when their health gets too low. That's my AI system rant for the day. I'm glad we spent the time and worked on AI outside of the game world to get a solid foundation, but now we're incorporating lots of elements that should ramp up the fun and challenge of the game. Anyone have experience with Rain AI? Is there something I'm missing with the asset management stuff? Any better Unity AI systems that are free?